Bottom Line: You can install this Quicksilver action to automatically format phone numbers to your liking. I hate how people format phone numbers in a million different ways. Just in the same way that I think YYYYMMDD is the best way to do dates, I prefer my phone numbers to be just 10 digits. No parentheses or dashes or spaces to get in the way, just numbers. I realize that they’re harder to read this way, but to be honest I practically never need to actually “read” a phone number. 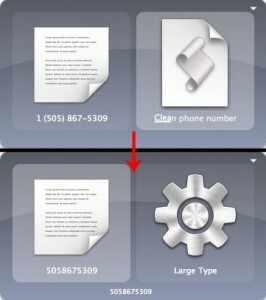 I just put throw into my iPhone, Contacts.app, Google Contacts, Google Voice, or what have you. Most of them do a pretty good job of figuring out the formatting, but feeding them 10 straight digits always works. No funny special characters to choke on. So I wrote a script with bash, AppleScript, and Quicksilver to do it for me. To be honest, more than anything, writing this script was way to learn a bit more about string manipulation, passing variables back and forth between shell and AppleScript, and how to make custom Quicksilver actions… but I figured I’d share it anyway. I’ll go through the workflow backwards, starting with the nuts and bolts of the bash part. Here’s the bash part. It takes input from and returns to AppleScript, which is how Quicksilver actions work. I’ve tried to do a decent job explaining steps in the comments. I set it to work with strings containing 7, 10, or 11 digits and spit out an error if there are more or less than that. It copies the formatted phone number to the clipboard (pbcopy) as well as returns it to Quicksilver ( echo $(pbpaste) ). I like having growlnotify tell me what’s going on, but I commented out those lines so if you don’t have it installed the script hopefully won’t choke. # Uncomment the growlnotify lines if you've installed growlnotify (highly recommended, get it at http://growl.info/extras.php#growlnotify ). #The "cat" here reads the input from the "echo " in the AppleScript action used by Quicksilver. #theNumber="0293209fjps9djf9s8dfu982392839ufsd89fu"; #comment the cat line and uncomment this for testing. #If it's got 7 or 10 digits left, go with that. # /usr/local/bin/growlnotify "n8henrie.com" -m "The phone number should be on your clipboard." #If it's got 11 digits (like the preceding 1), take the last 10.
growlMessage="I think something went wrong with fixPhoneNumbers.sh. "$'\n\n'"Are you sure the string you sent it has either 7, 9, or 10 digits?" Once you’ve saved it there, you might need to restart Quicksilver (ctrl + cmd + Q) or at least refresh the catalog (opt + cmd + r while QS is open) to get Quicksilver to notice it… but after that you should be able to take a string from the first frame and run “Clean phone number” as the action. Here’s how it works IRL — enjoy!